WEST Coast-listed trio Simon Tunbridge, Scott Lycett and Malcolm Karpany have put their names in the mix for an AFL call-up after leading East Perth to a comfortable 50-point win over Norwood to complete Round 1 of the Foxtel Cup. 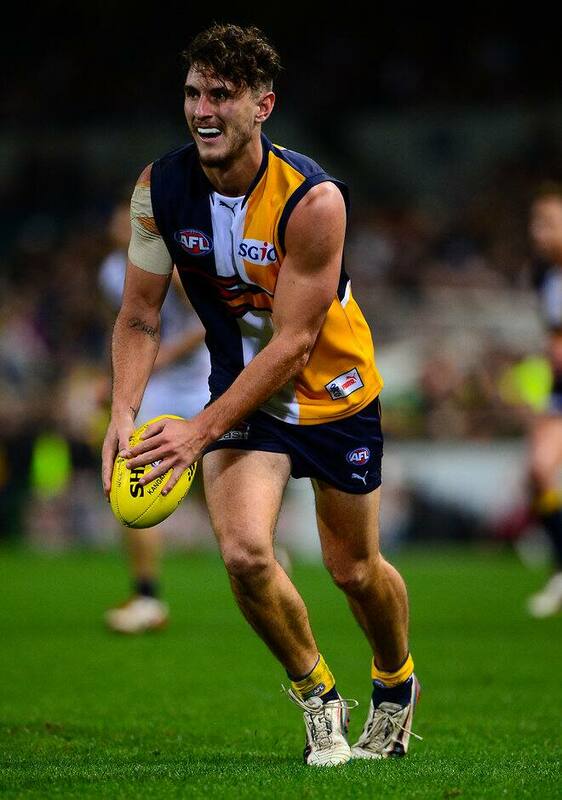 With Eagles coach Adam Simpson and a host of senior players watching at Patersons Stadium, Lycett dominated in the ruck and Tunbridge and Karpany were clean with their ball use in the slippery conditions. The 203cm Lycett had eight disposals, six marks, 18 hit-outs and kicked the opening goal of the match while Tunbridge finished with 16 touches and kicked two goals. Karpany, pick No.31 at last year’s NAB AFL Draft, was lively for the first three quarters, using his pace to help set up many attacking moves and finished the game with 13 possessions. Lycett has played three games for the Eagles in 2014 while Tunbridge’s sole appearance was the WA derby against Fremantle in Round 7. The Royals – who fielded nine West Coast-listed players – made amends for their opening round defeat in last year’s competition, outclassing the Redlegs to win 9.11 (65) to 2.3 (15). The Royals, runners-up in the WAFL last year, will now face VFL side Williamstown, the 2011 Foxtel Cup champion, in the semi-finals. The only downside to the win was a nasty collision late in the match between Lycett and his Royals and Eagles teammate Brandt Colledge, which saw the later stretched off after the match had finished. Norwood fielded a relatively inexperienced line-up with seven players that haven’t been seen at senior level in the SANFL yet and only one member from last year’s SANFL premiership team - Simon Phillips - making the trip. East Perth flexed its muscle in the opening few minutes, dominating the possession count in the first term 67-34 and constantly putting the ball into dangerous positions to score. But the Royals forwards couldn’t capitalise early, highlighted by big man Paul Johnson hitting the post from 15 metres out almost directly in front. When the rain started to fall in the second term, the floodgates opened after West Coast rookie Will Maginness kicked a clever goal from the boundary line to stretch the Royals’ lead to 21 points. East Perth kicked another three goals for the term to open up a commanding 40-point lead at half-time with Eagle-listed Tunbridge and Karpany prominent. The Redlegs battled hard but lacked the polish and class that East Perth had in its line-up. The ball was in the Royals’ forward line for 70 per cent of the first half and they had 42 more possessions than Norwood. Phillips, who led the side in the absence of regular captain Kieran McGuinness, finally kicked Norwood’s first goal of the match six minutes into the third term. Tom Clayton was denied the Redlegs’ second goal when the umpire deemed he played on after the three-quarter time siren sounded. When Mac Bower soccered through Norwood’s second goal of the game late in the final term, it saved the Redlegs from the dubious honour of the lowest-ever score in the four seasons of the Foxtel Cup, ensuring Queensland side Mount Gravatt retained that record. Tulio DeMatteis led the way for Norwood with 15 possessions while Kane Murphy – son of former Sydney Swans wingman David – also worked hard against the Royals midfield. Dylan Auciello battled gallantly in defence. Patersons Stadium will host the first semi-final on Tuesday, June 24 between reigning WAFL premiers West Perth and Tasmanian State League newcomers the Western Storm.